← Man & Daughter See Orange Orbs Hovering in Sky. Video Taken. 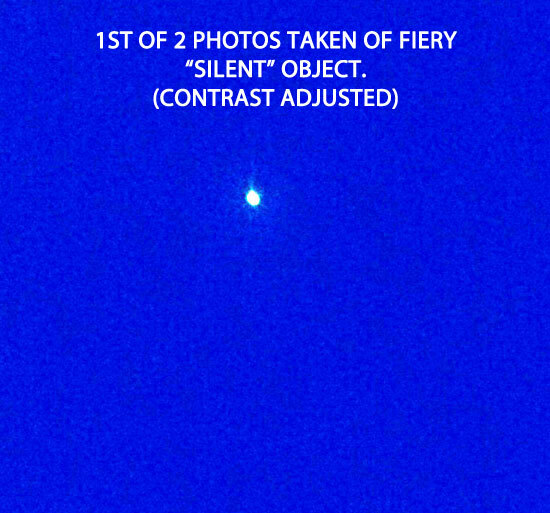 Man Takes Photo of Unknown “Silent” Fiery Object. 1ST OF 2 PHOTOS TAKEN OF UNKNOWN FIERY OBJECT. Description: Well here are 2 pictures I took last week. I was coming out of Scarborough downs in Maine (OTB) 11/24/15 and saw this ball of fire all same color flying by at about 1,000 feet. I, first thought it was a small plane with engine on fire, but as it passed by there were no sounds. It was too fast for a hot air balloon and it continued to fly east probably. I watched it for 30 seconds until I couldn’t see it. It was, very weird. This entry was posted in circular, Fireball, Orb-like craft, Orb(s) of Light, Photos, possible meteor, silent, UFO Sightings 2015, UFO Sightings Maine. Bookmark the permalink. One Response to Man Takes Photo of Unknown “Silent” Fiery Object. This was probably a Chinese lantern or a meteor. And I’m guessing the altitude & time of observation are likely not precise.